The Guide to IMMUNOPHARMACOLOGY provides lists of targets associated to top-level cell type categories. The GtoImmuPdb help pages provide more information on GtoImmuPdb cell type data. 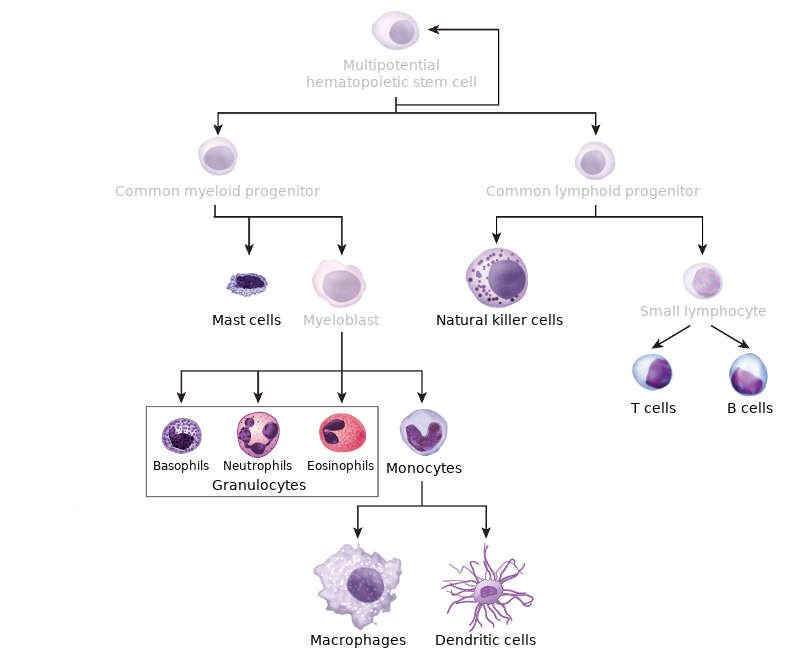 The interactive image shows several of the immune system cell types, showing how the differentiate from one another. GtoImmuPdb has data on those not greyed out. Click on them to see all drug targets associated to that cell type. Use the interactive diagram to navigate to target association data for a cell type category. GtoImmuPdb contains data detailing immunological cell types and their associations to GtoPdb targets. The list of categories you see here are top-level immunological cell type categories defined by GtoImmuPdb against which targets in the database have been annotated. GtoImmuPdb also uses terms from the Cell Ontology to help define the categories and to support annotation of targets to each category. The Cell Ontology terms used to define each category are shown, with links from their IDs to the EBI Ontology Lookup Service, which gives more detail and context for the term. Click on a category to see all targets associated with it. Below is the full list of cell type categories, showing Cell Ontology terms (and definitions) assigned to them. Click on the category title to view the detailed list of target associations. lymphocyte of B lineage (CL:0000945) - A lymphocyte of B lineage is a lymphocyte that expresses CD19 on the cell surface. An additional defining characteristic is the commitment to express an immunoglobulin complex. Types of B lineage lymphocytes include B cells and antibody secreting cells (plasmablasts and plasma cells). Lymphocytes of B cell lineage can be distinguished from those of T cell lineage by their lack of CD3e (as part of the T cell receptor complex). dendritic cell (CL:0000451) - A cell of hematopoietic origin, typically resident in particular tissues, specialized in the uptake, processing, and transport of antigens to lymph nodes for the purpose of stimulating an immune response via T cell activation. These cells are lineage negative (CD3-negative, CD19-negative, CD34-negative, and CD56-negative). granulocytes (CL:0000094) - A leukocyte with abundant granules in the cytoplasm. Synonyms: granular leukocyte, polymorphonuclear leukocyte. innate lymphoid cell (CL:0001065) - A lymphocyte that lacks characteristic T cell, B cell, myeloid cell, and dendritic cell markers, that functions as part of the innate immune response to produce cytokines and other effector responses. macrophages (CL:0000235) - A mononuclear phagocyte present in variety of tissues, typically differentiated from monocytes, capable of phagocytosing a variety of extracellular particulate material, including immune complexes, microorganisms, and dead cells. monocytes (CL:0000576) - Myeloid mononuclear recirculating leukocyte that can act as a precursor of tissue macrophages, osteoclasts and some populations of tissue dendritic cells. mast cell (CL:0000097) - A cell that is found in almost all tissues containing numerous basophilic granules and capable of releasing large amounts of histamine and heparin upon activation. Progenitors leave bone marrow and mature in connective and mucosal tissue. Mature mast cells are found in all tissues, except the bloodstream. Their phenotype is CD117-high, CD123-negative, CD193-positive, CD200R3-positive, and FceRI-high. Stem-cell factor (KIT-ligand; SCF) is the main controlling signal of their survival and development. natural killer cell (CL:0000623) - A lymphocyte that can spontaneously kill a variety of target cells without prior antigenic activation via germline encoded activation receptors and also regulate immune responses via cytokine release and direct contact with other cells. gamma-delta T cell (CL:0000798) - A T cell that expresses a gamma-delta (γδ) T cell receptor complex. A major subset of human γδ T cells express Vγ2Vδ2 TCRs (also termed Vγ9Vδ2 TCRs). memory T cell (CL:0000813) - A distinctly differentiated long-lived T cell that has the phenotype CD45RO-positive and CD127-positive. naive T cell (CL:0000898) - Mature T cell not yet exposed to antigen with the phenotype CCR7-positive, CD45RA-positive, and CD127-positive. This cell type is also described as being CD25-negative, CD62L-high and CD44-low. mucosal invariant T cell (CL:0000940) - An alpha-beta T cell that is found in the lamina propria of mucosal tissues and is restricted by the MR-1 molecule. stromal cell (CL:0000499) - A connective tissue cell of an organ found in the loose connective tissue. These are most often associated with the uterine mucosa and the ovary as well as the hematopoietic system and elsewhere. alpha-beta T cell (CL:0000789) - A T cell that expresses an alpha-beta T cell receptor complex. effector T cell (CL:0000911) - A differentiated T cell with ability to traffic to peripheral tissues and is capable of mounting a specific immune response. regulatory T cell (CL:0000815) - A T cell which regulates overall immune responses as well as the responses of other T cell subsets through direct cell-cell contact and cytokine release. This should encompass most cytotoxic and helper T cells, as well as regulatory T cells.